Hey Guys. I just realized when starting this post that it’s been over a year since I gave you an update on my Mom and Dad. I did mention the first of February that my 87 year old Dad had emergency surgery for a ruptured appendix, but nothing about family since then. After my first post about Alzheimer’s I realized it is a disease that touches many of you too. The feedback I got from you guys was touching and in some cases heartbreaking. I have a question for any of you who have a relative with Alzheimer’s . But we’ll get to that later. I will probably stumble my way through the post. It’s hard for me to write personal stuff especially when it involves other people. I filmed a short video of the snowfall we had while I was visiting. 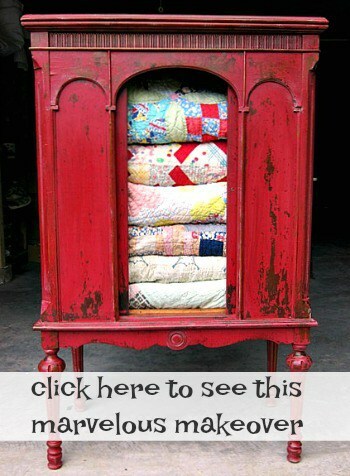 It’s at the bottom of the post if you would like to view it. Dad was in the hospital for 11 days in February after they removed his appendix. I don’t mind telling you that I was terrified during the whole thing. His recovery is just one of the many things I’m thankful for this year. His surgeon was great and she said Dad was responsible for some of her gray hairs. We convinced Dad after much talking to go to the nursing home for rehab after leaving the hospital. He was in the same nursing home as Mom. We had some ups and downs in the nursing home with medications and dosages but he did fine and only stayed in about 3 weeks. He was doing great when he came home only to come down with Shingles.My poor dad, what else can happen. It has been a long few months but Dad is finally getting his strength back. There were many conversations with Doctors, nurses, pharmacists, and family members, about medications. No one in our family is a Doctor but we learned a lot and we learned to question the Doctors when we thought something should be checked or a medication might need to be changed. I told my sister I’m giving up my Doctor’s license. How do we know if we are making the right decisions. So far things are improving so I’m done with the medications debate.I have a great appreciation for caregivers and a sad heart for people who have no one to ask questions for them. I’ve been spending a lot of time in Arkansas. 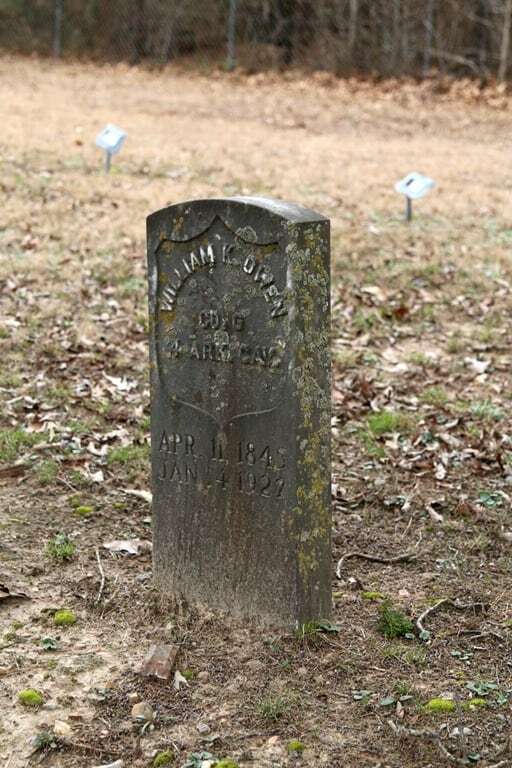 When Dad feels like it we take rides to the Old Owen Cemetery. He tells me stories of relatives who passed away before I was born or who died when I was too young to remember them. I love hearing the stories and I’m so glad I have the time to spend with him. Dad and I hang out with relatives, visit friends at the new assisted living place in Star City, and do a lot of eating….either I cook or we go out to eat. Dad loves to socialize so we go out to eat a lot, mostly at lunch time. I still make a banana cake every single time I go to Arkansas. And usually peanut butter cookies. When I get a chance I make goodies for the staff at the nursing home. Mom is still doing the same. She is eating better now than she did when she was at home and has actually gained 3 or 4 pounds this past year. She sits in her chair all day and only gets up with assistance when she needs to go the bathroom. She sleeps a lot and watches TV. When a singing group comes to the nursing home she loves to listen to the music. She doesn’t communicate well but sometimes we can piece together what she is trying to say. We laugh a lot and a silly sometimes, but you have to be. Dad goes to visit Mom twice a day and always feeds her supper at night. Now that it gets dark early I think we have convinced him not to go out at night. 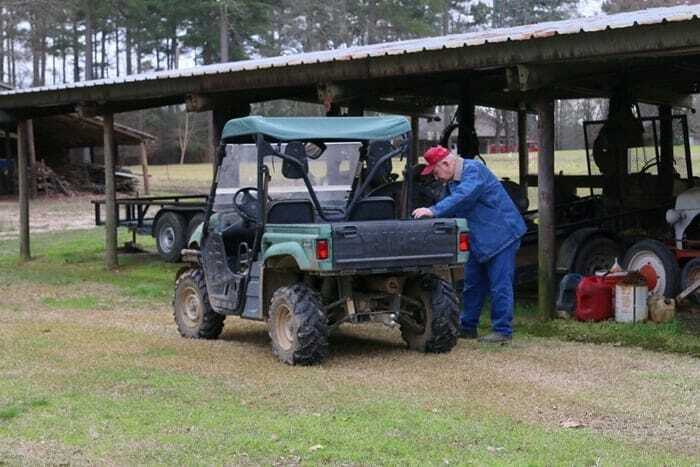 It is about a 15 minute drive each way to the nursing home. We really appreciate the nursing home staff and their dedication. There are usually hugs all around when we go in to visit. We have become friends with many of the patients and sadly we have seen many of them go. Miss Lottie, the 107 year old resident, passed away this year. She was such a hoot and at her age could still wheel herself around in the wheelchair. My brother and sister were in charge of the garden again this year. I know Dad just shook his head every time he looked at that garden. Grass everywhere. 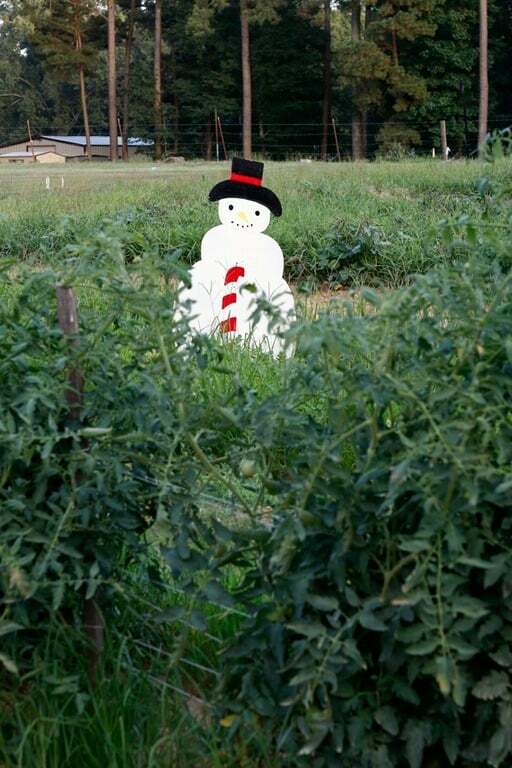 Did you notice we have Snowmen Scarecrows, hahahaha. That was Dad’s idea. He pulled them out of the storage shed. Hey, we need some laughs. 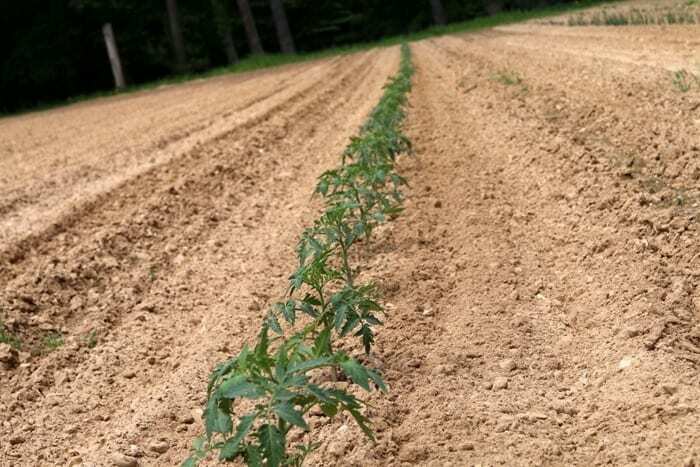 I was in Arkansas when it was time to plant the tomatoes, peppers, okra, and a few more things. 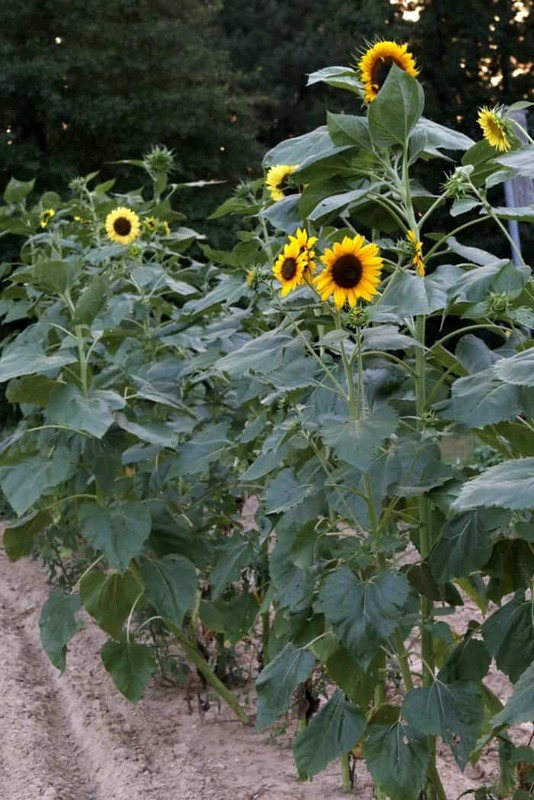 I wasn’t there to plant the sunflowers this year so my sister Stacey did. 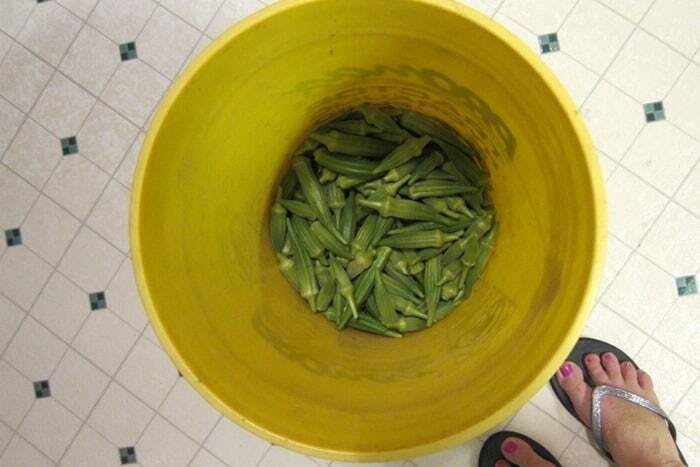 I had to pick the okra several times while Stacey was on one of her many vacations. 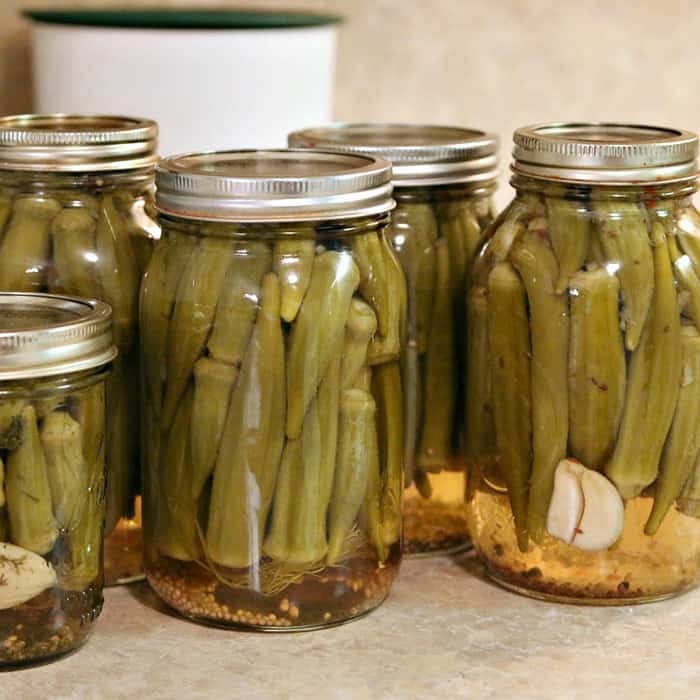 She made me get in on one of the okra pickling marathons. 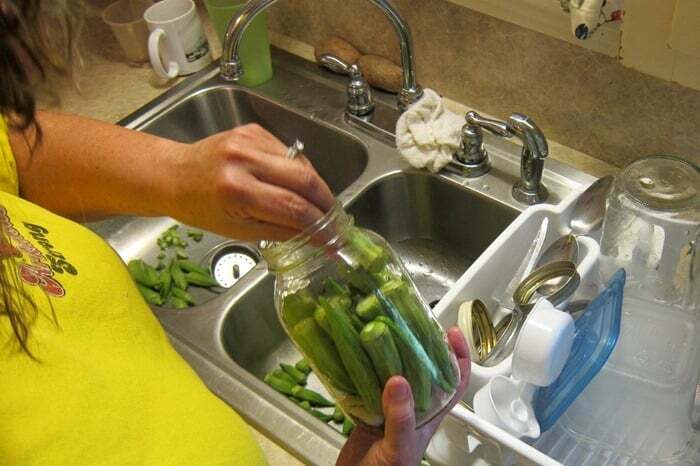 This is Stacey stuffing the okra in the canning jars. Stacey really enjoys canning and freezing the vegetables and working in the garden. That’s not me. When Dad is trying to be funny (meaning sarcastic) he says, referring to me “You have farming in your blood”. Very funny Dad. I wrote a story about my Grandparents home 2 years ago (gosh time goes fast). The house belongs to my cousin’s son now and my cousin just recently had it remodeled. The photo above is one I took two years ago. This is how the house looks after the remodel. My cousin kept as much of the original structure as she could. 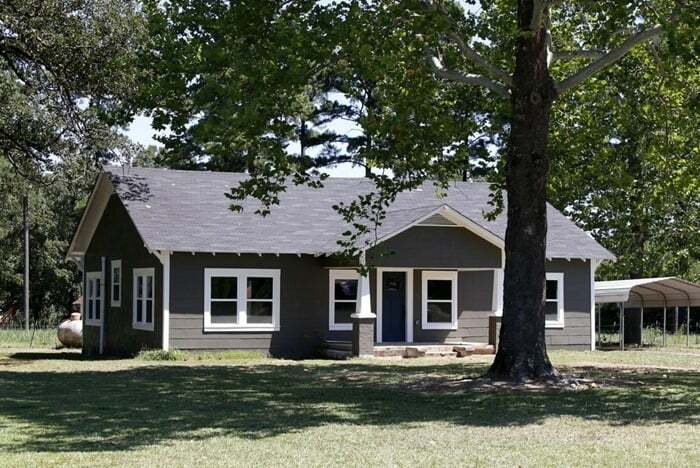 They painted over the asbestos shingles and I love the color. It is certainly different from the original look. The house was built in 1947 and I enjoyed hearing Dad tell about building the house. He was 17 when they built the house. The original walls had been covered with sheetrock and paneling over the years. All of that was ripped out along with carpet and layers of old linoleum. 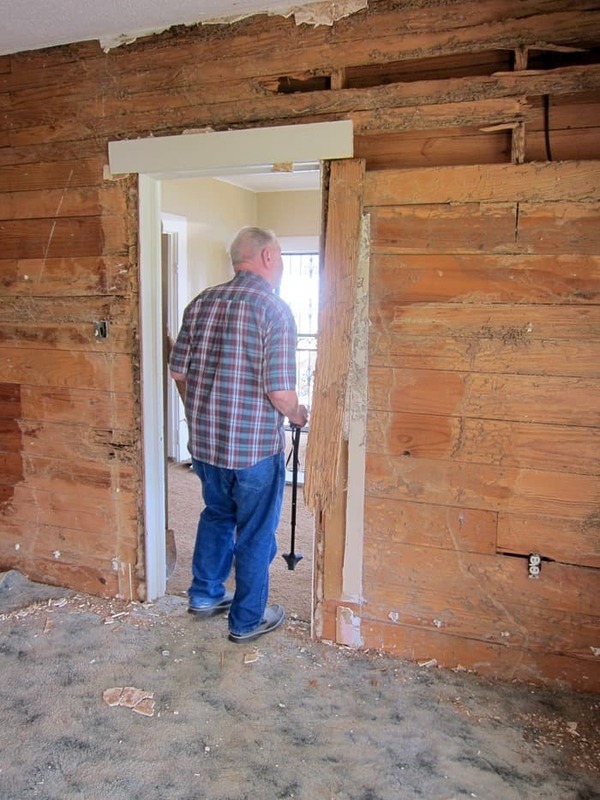 At one time there was a termite infestation in one small corner of the house. The damage was done years ago and there are no termites now. 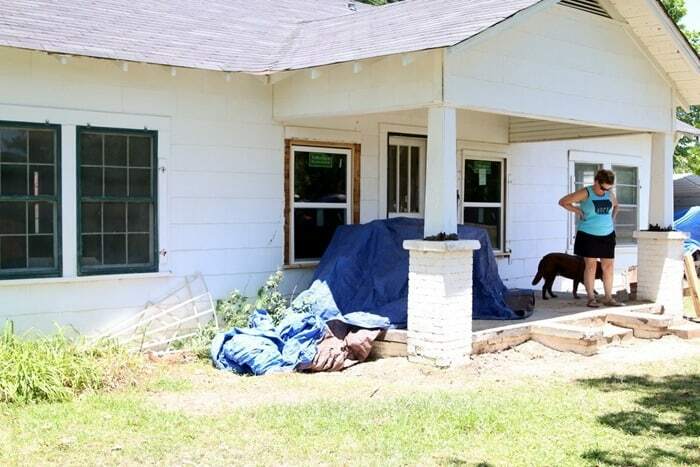 I took pictures of the remodel every trip I made to Arkansas. I have a ton, but I want share them all. You’re welcome. 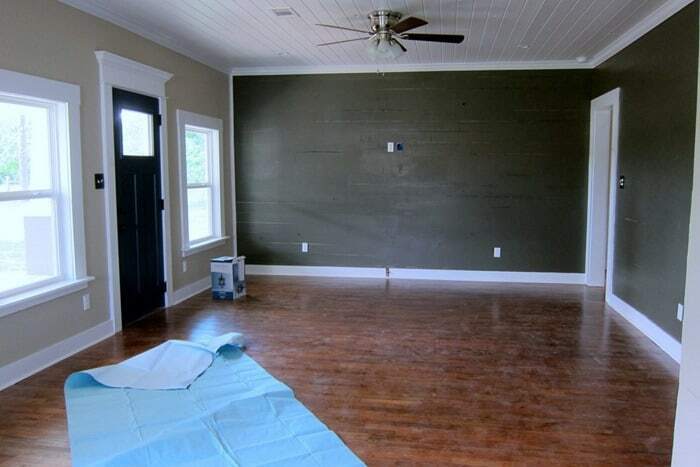 The house has shiplap, real shiplap. Dad says he remembers cutting the boards. The house had high ceilings but in most of the rooms drop ceilings had been put in at one time or another. 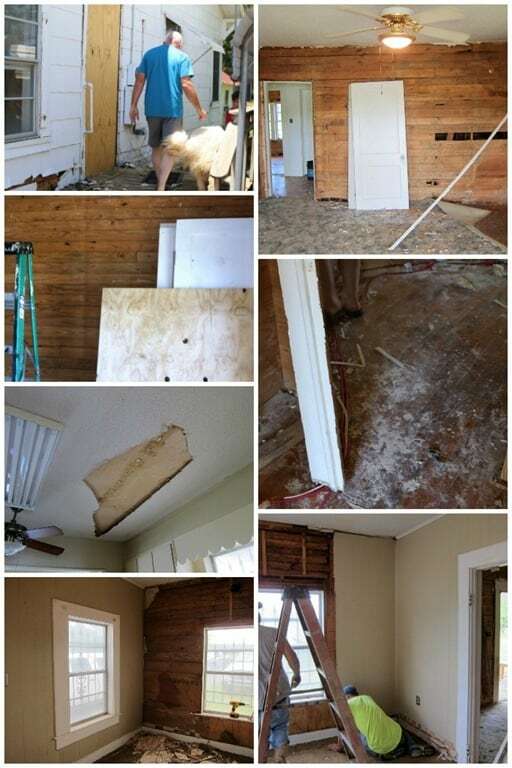 All of the drop ceilings were removed. 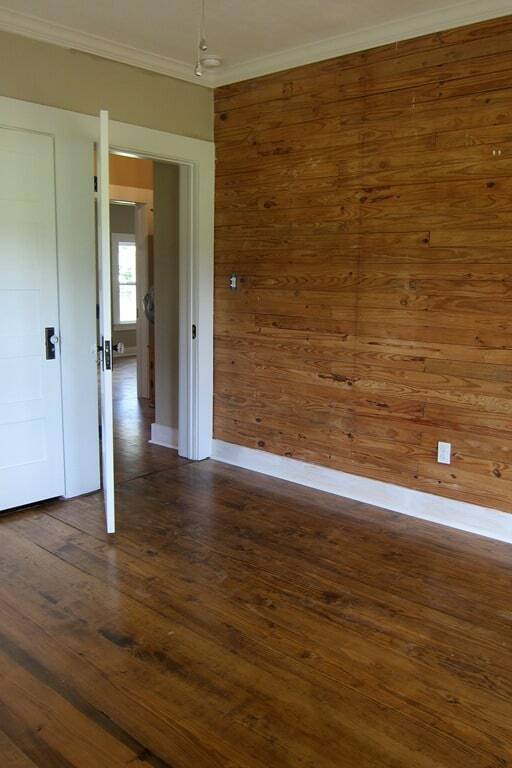 Real shiplap on the walls and real wood floors. My cousin kept the shiplap walls that weren’t damaged. She painted some of the shiplap walls and left some of them natural. I love all of her color selections. 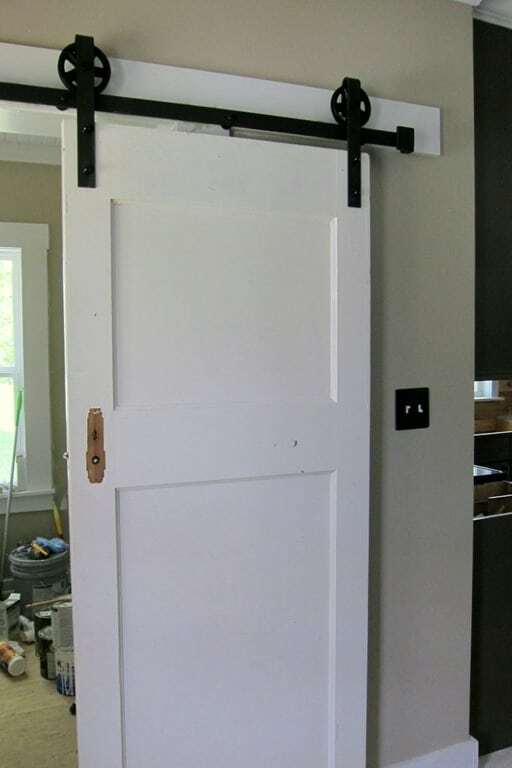 Sliding door for the laundry room made with one of the original doors from the house. I have a few doors from the house but don’t know what I’m going to do with them. 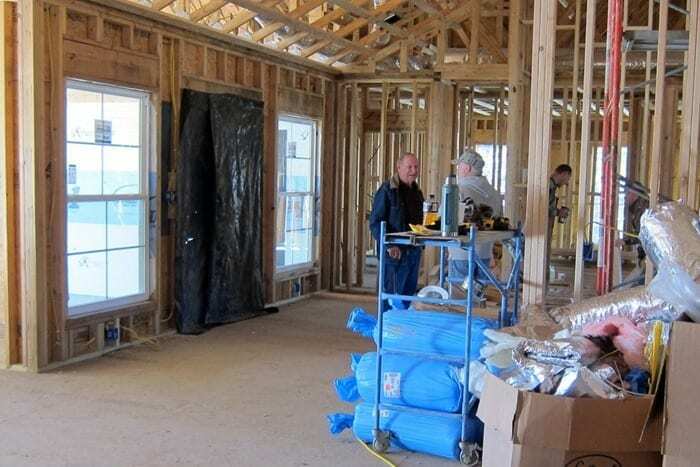 This is a picture of a new house going up, my nephews house. Dad is looking it over. 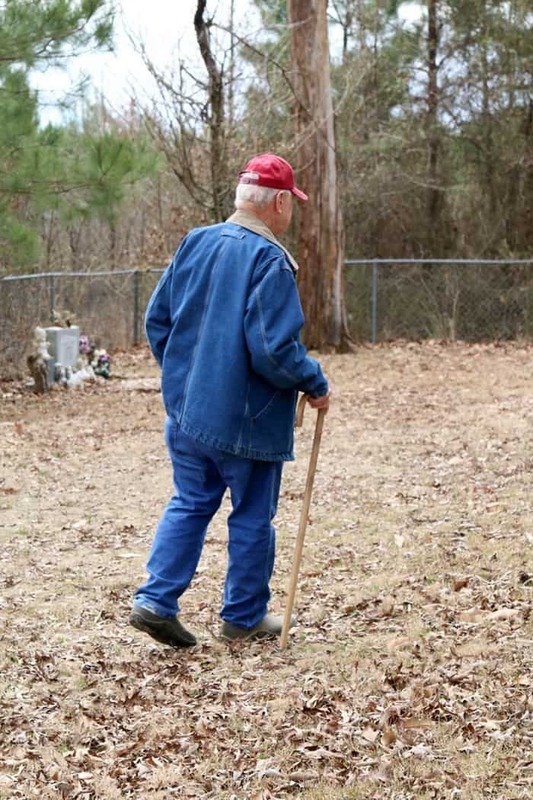 He’s glad his grandson and family will be living within a mile of him. 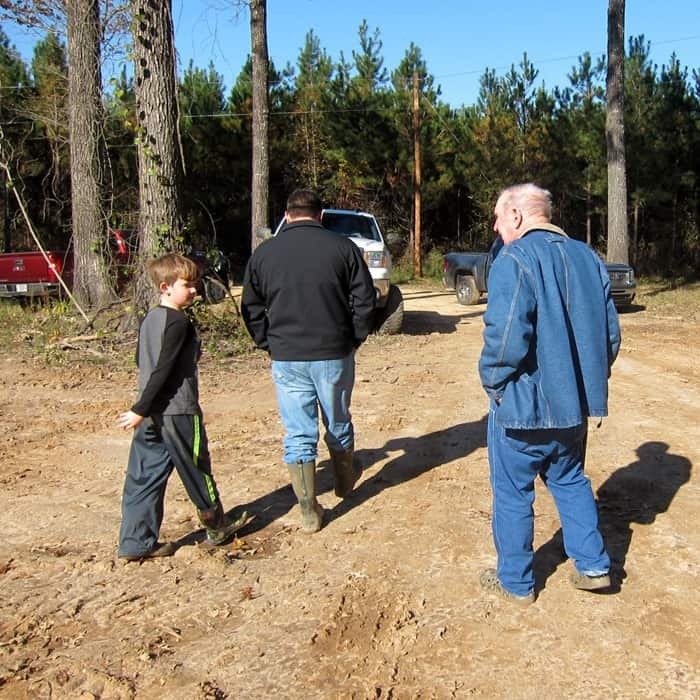 Another of his grandsons just built a house 2 miles from Dad in the opposite direction. One last photo of Dad with grandson and great grandson. I’m thankful for you guys. Thanks for reading my stories and commenting on my projects. Now I have a question for those of you who have a relative with Alzheimer’s. How do you feel about genetic testing to see if you carry one or more of the genes or variants that indicate you might have a chance of getting Alzheimer’s? Would you have the test? Have you had the test? I keep going back and forth. At first it was a definite no, then I decided I might have it done, now I’m at a definite no again. I read articles on Alzheimer’s all the time and I copied this from an article I found online…..Genetic testing can be difficult emotionally, not provide conclusive results and cause practical difficulties. That says it all. 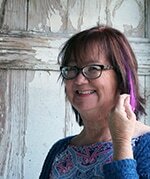 To read our Alzheimer’s and Arkansas stories from the beginning start here….Getting Personal. I wouldn’t want the DNA test to check if I had the markers. Alzheimer’s is a terrible, awful disease and as of now there is no real treatment available, though there’s a lot of research going on. I think the test would add a lot of unnecessary angst and worry to one’s life because just having a genetic marker doesn’t mean that gene will be expressed. They’re now looking at certain infections that may trigger Alzheimer’s. Since the DNA test doesn’t say for sure that you are going to get the disease and since there’s no real treatment, why add additional worries to your life when there’s nothing to be done about it? There’s just no benefit from knowing. Kathy, I recently was involved in telling a friend’s daughter that I think she (my friend) had a problem. The daughter lives 5 hours away and didn’t notice anything wrong over the phone during times she spoke with her mom. When I asked my friend to meet me at the post office and she didn’t know what I meant, I knew there was a problem. Thankfully the daughter acted on my call immediately and now she is caring for her mom at her home in Beaumont. Sadly, after over a year,, they are still in a FEMA trailer after Harvey. But her mom has been properly diagnosed and is now getting the care she needs. The daughter recently mentioned that they were getting the dna testing done. I think it’s like the question, if you could know the time of your death, would you want to know? Different reasons for “yes” or “no.” As far as Alzheimers goes, I think you would be able to prepare for it better if you knew. Especially if, like me, you have no children who could help with everything. 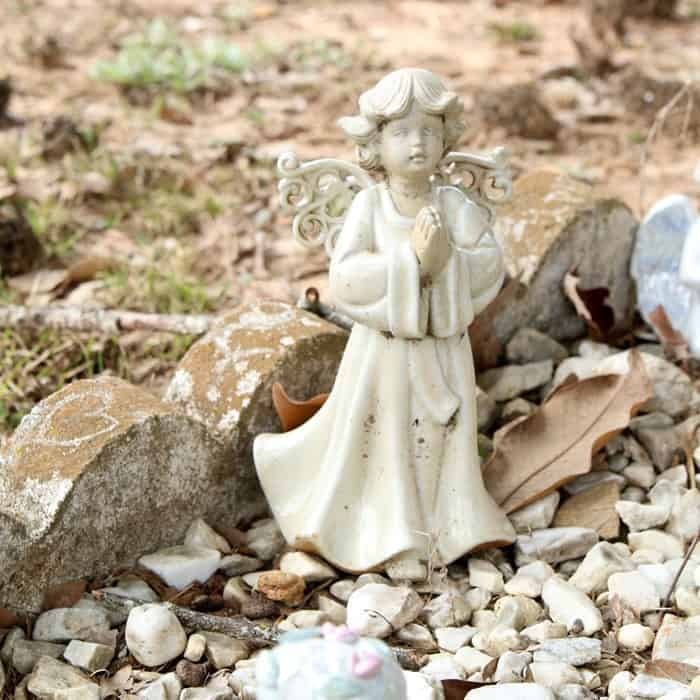 A family friend died after complications with Alzheimers, and a friend’s husband died with Lewy Body Dementia. She took care of him as long as she could and has just completed a book about the experience. It’s a horrible thing. I pray one day there is a cure. God’s blessings on you all. Kathy, one of the things to understand is that there are many forms of dementia and most people, even doctors, refer to all forms as Alzheimers, because that is a term most people recognize. Many people will develop dementia, especially in the later stages of life, and, depending on the root cause, the behavior and symptoms that are manifested can be different. Both of my parents were diagnosed with “Alzheimers.” My dad was in his late 80’s when he was diagnosed, so his was most likely a form of dementia caused by circulatory issues. My mother was in her early 80’s and was diagnosed after a severe stroke, so the onset was very sudden. Probably neither was true Alzheimer’s. I say all this just to point out that genetic testing for Alzheimer’s may give one a false sense of security if the test is negative. Also, the rate of progression is different for each individual so just knowing that one is susceptible cannot give a true picture of what to expect. Thank you for your update of your Dad and Mom. You are fortunate to be able to spend time with them. It’s good that your Mom is in a facility where they are taking care of her. I don’t have anyone in our family with Alzheimer’s/Dementia but I know it is horrendous in many ways and also for the caregivers. As many have stated if there was a cure then it would be good to know otherwise it is something else to worry about. Most people are aware of the signs. We can hope for the best. Thank you for sharing. My brother has Alzheimer’s. Now, I was skinny forever and then gained weight due to several factors. I hadn’t seen my brother for awhile and went to Wendy’s to have lunch. The first thing he said “Sharon, you are fat”. Well, we all laughed because he could only remember me being skinny. My sister-in-law is very knowledgeable concerning Alzheimer’s and is involved in chapters looking in to how to manage this disease. My brother is still at home; she takes such wonderful care of him. He is 84. One of the vitamins he is on has really helped him. Oh, I called to their home one day and said, tell Rita I called. Well, he said, “Sis, you know I won’t remember this when I hang up the phone”. I only tell you this because the disease pretty much stays the same and we have to have a good laugh occasionally. Blessings to you and your family and thanks for all the writing you do!! What a nice post. 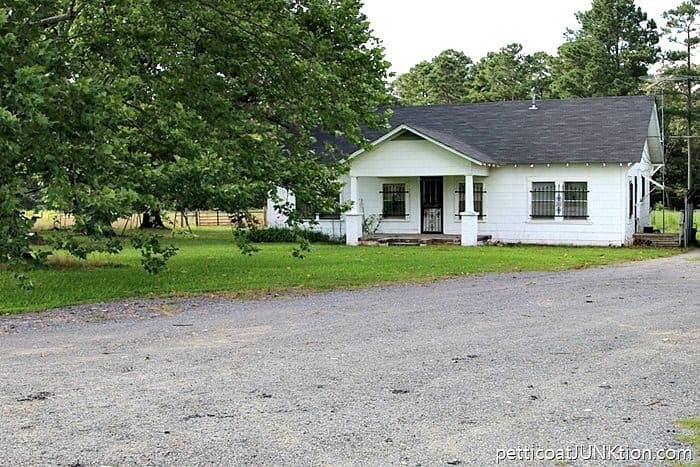 You are so lucky-my cousin sold the house our Grandfather was born in in the 1800’s. His Grandfather homesteaded that property in the 1850’s. I’m the last of that blood line living on the original property. (sigh) Wounded. Love the wood all over the house and it looks beautiful. I hope you family keeps the house and its surrounds for many years. Excellent job updating your family story. I thoroughly enjoyed reading it. You are so fortunate to have so much family. And, family living close to enhance your mother and fathers life as they age and also alleviate some of your concerns. So glad your dad is thriving inspite of his setbacks. I am a caregiver for my dad who has Alzheimer’s, in Arkansas! My thoughts on testing are not to do it. I’m not sure of the benefits of testing. I think the treatment course would be the same and we all know the early signs. I’m such a planner in every other area of life but I don’t think this info would help me. I think I would just worry about something I can’t control. Meanwhile, I’ll do my best for Dad and try to keep myself mentally healthy. It’s a tough choice. Do what feels right for you. Kathy – I salute your honest, tender and poignant tale of family. It takes a lot of courage to do what you did. My grandmother, mother and her two sisters all had Alzheimer’s – or something that was given a label of Alzheimer’s – how they decide whether to call it dementia, confusion or Alzheimer’s I don’t know. To me, the process of diagnosis and differentiation appears to be highly questionable and the basis of it flawed. But, seeing all four of my close relatives with supposed Alzheimer’s, I have always thought it made it more likely that I’d get it too, as being next in the female line. Then my daughter got one of these dna ancestry tests done, and that showed up the Alzheimer’s gene on my side of the family. She told me without my asking or even being aware that she had this information. I was not dismayed by it but I would not have wanted to get this information this way and I would never have done this or any other test for Alzheimer’s. I think this is sound reasoning. It is too easy to get alarmist about this. Plus, I have real concerns about such information potentially being used against me with regard to insurance and who knows what else. Thank you for sharing your story, Kathy. I wish you the best possible with all your family concerns.